Mounted on the Canon EOS 5DS R used for this review, the Lensbaby looks very much the part, weighing in at 375g or 13.20 ounces. Quality of finish is generally good. 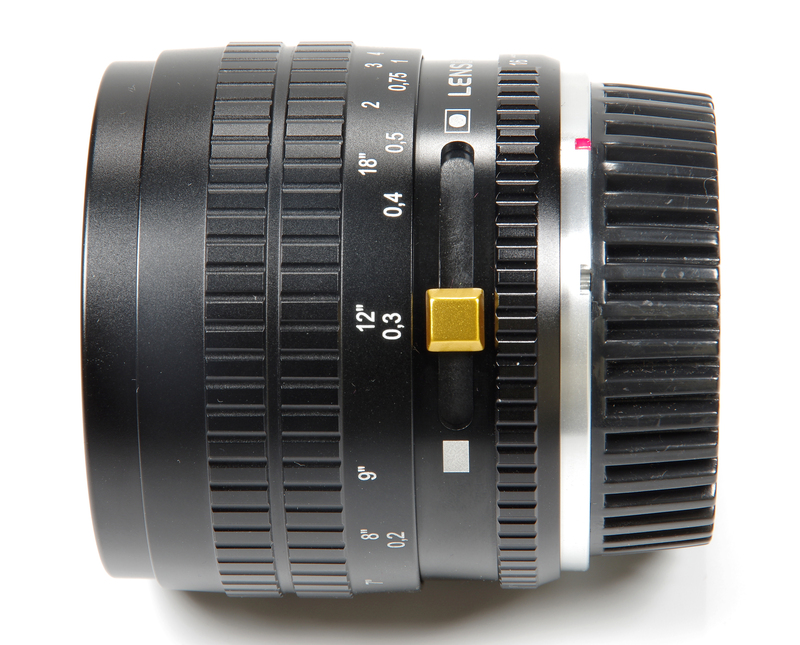 There is a 62mm filter thread and within this the front element of the lens is very deeply recessed, forming in effect its own lens hood. The manual focus ring is smooth in operation but quite firm, certainly when new, and a small amount of rotational play can be felt in the lens/mount interface. This will not affect the image in any way of course. Moving closer to the mount, there is the vignette control and as is sometimes the case the opportunity to add a depth of field scale has been missed. This is a pity as there is plenty of room for such a scale and it can be useful. Closest to the camera is the aperture ring, light in operation and with a non-linear spacing. The gap between the aperture settings becomes much less as we approach f/16. The ring is quite lightly made, although to be fair the click stops are just the right tension, being positive without being too firm. 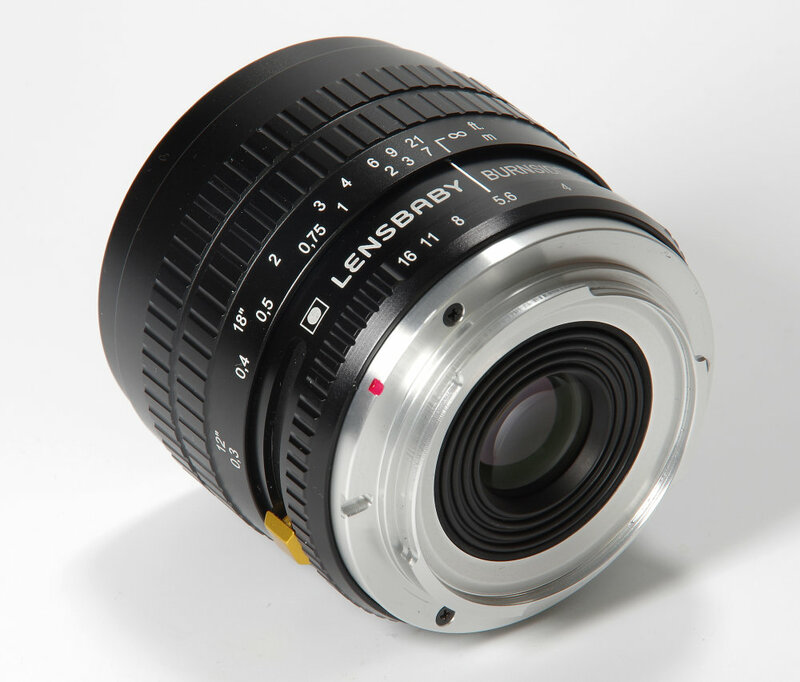 This is a fully manual, manual focus lens, so there are no electronic contacts between lens and camera. 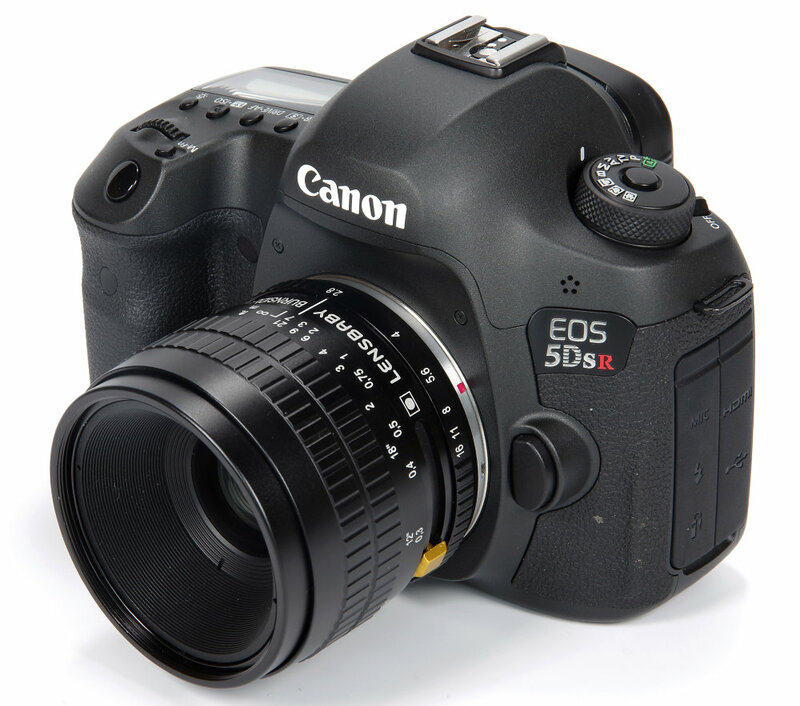 The Canon EOS 5DS R worked very well using Av mode and metering was generally accurate. The aperture stays at the value set, the diaphragm having 6 blades. There is a secondary 8 bladed internal aperture for effect enhancement and vignette control. This is adjusted by the gold coloured lever on the lens and offers four settings from no vignette to maximum vignette. Focusing is down to 6 inches (15.24cm), measured from the front of the lens. The optical design offers full frame coverage, using 6 elements in 4 groups. The optics are multi-coated. A wide range of mounts is available, including Sony E, MFT, Canon EF, Nikon F, Pentax K, Samsung NX, Fuji X and Sony A. To obtain the maximum “swirly bokeh” effect the instructions indicate that the main subject should be within 3 feet of the lens and the background 12 feet or more away. Add to this the four vignetting options, plus different effects using full frame or crop sensor cameras, plus of course different subject matter, and we have a vast array of creative options to explore. Some photographers will revel in this and grasp those possibilities, others may see just a rather muddy image outside a tolerably sharp central area. The Petzval inheritance would normally be directed at a short telephoto design for portraiture, but here again we have a new option with 35mm being a “wide standard” lens on full frame cameras and a “standard” lens on APS-C. The effect on MFT would be similar to a short telephoto, approaching more the idea of the Petzval portrait lens. Handling of the lens is absolutely fine, with no issues at all. The skill will be in identifying the right sort of subject matter and then exploring in depth the myriad possibilities that various settings and distances demand.